ZYLOFON is giving airdrops.Does it have any link with cryptogram? Few days ago, i received up to 12 crypto gram with [Good luck with cryptogram ] as attachment. 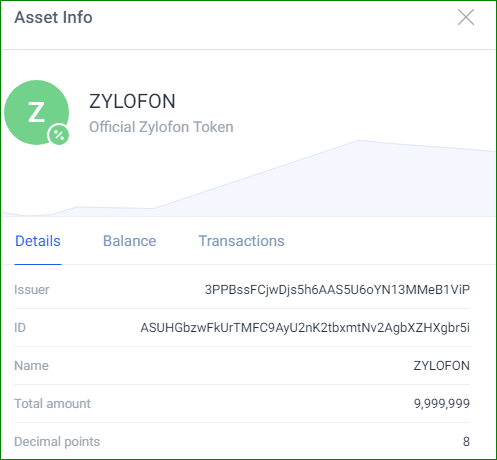 I just received Zylofon token in the same wallet with attachment [Good luck with zylofon]. I cannot find the site or other info of this coin. gudluck indeed coz we don’t receive of it! lol! Creators (Developers and Sponsors) get royalties for their work. And that if one maintains minimum of 200 ZCO Tokens, the person becomes a sponsor and would be paid daily royalties from the sale of its contents. it sounds nice so i bought 400 ZCO Tokens and iam waiting for tomorrow to see if it is true that i will receive daily royalties. Or is there any one with any Info about them? I received 2 ZCO Tokens added to my 400 ZCO i bought yesterday with descriptions[Royalties’ payment for the day; Good Luck with zylofon] Though i don’t know how this is calculated but hope will continue this way. Distrubution of Zylofon Tokens to Holders continues Every Day with description [Payment of daily royalties-Good Luck]. Any idea? I am told that, Zylofon is an Existing Project. A digital Project development and distribution platform where Creators (Developers and Sponsors) get royalties for their work. And that if one maintains minimum of 200 ZCO Tokens, the person becomes a sponsor and would be paid daily royalties from the sale of its platform’s Products. I learnt they have been doing this for some time now to their local market and pay royalties manually in fiat currencies to its members(Developers and Sponsors). And that they have integrated their operations with blockchain and will soon Publish their Platform where all their products will be sold for ZCO tokens, Their products i heard is owned by (Developers and sponsers ). i bought 400 ZCO and i get royalties each day. You can also try by buying 200 ZCO or more and i believe you will also earn daily royalties. •Investors realize gains through capital gain. As more creators and consumers purchase the coin the more it will increase in value. •Token holders buying any product from Zylofon will receive a discount on the product bought. •Token Holders who qualify as content Creators (Developers and sponsors) daily weekly royalties based on their ZCO balance. So far, i have not seen any site link yet, Information reaching me is that,they are currently withholding that, and are set to make their Platform public before October ends. According to the information, Its going to be a soft launch. And that the Token is 9,999,999 Non-Re-Issuable in total, which they are planning to Release 3,999,999 ZCO tokens from now to November end into circulation. And that no token will be release after that unless till July, 2019.
what’s the source of your information? I think he is the owner pretending to be told by without citing any site, lol! who will support a coin without any site to read for? and reason to hold for!